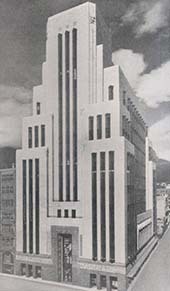 The building was opened as the head office of the SA Mutual Life Assurance Society in 1940 to rapturous acclaim by the local and architectural press. At 95m in height it was the tallest building in Africa (apart from the pyramids). Marble, gold leaf and stainless steel were used in this art deco masterpiece. The architects were LOUW & LOUW in association with F.M. GLENNIE, well known and respected for his work as a mentor to a generation of architects, including his son David - a long-time member of VASSA. The unique frieze surrounding the three sides of the building abutting Darling, Parliament and Longmarket Streets was designed by Ivan MITFORD-BARBERTON and executed by a team of Italian masons. The frieze depicts the ideological impact of Europe on South African history and the positive effects it had on the development of the Old Mutual. In the Assembly Room - also known as the Fresco room - on the 8th floor are murals by Le Roux Smith le Roux which were completed in 1942 and which express the positive conception of the Old Mutual as a social benefactor in the industry. Each of the six passenger lifts has an engraving on the door and the pattern etched in the tall glass window of the Banking Hall echoes the external shape of the building. With the consolidation of Old Mutual at Mutual Park in Pinelands from the 1960s onwards, the building became redundant and there was a great deal of speculation about its future use. The architectural practice, LOUIS KAROL ASSOCIATES, undertook the conversion of the building in 2004/5. Old Mutual retained ownership of the Assembly Room and Banking Hall. The balance of the office space was converted into about 180 sectional title apartments, and the building was renamed 'Mutual Heights'. The article sent to us by William MARTINSON.